It has been a while since I have been out with Charleen and Kimberley. On a random weekend, we decided to drop by The Mama Shop at Pearl's Hill Terrace opened by Felicia Chin and Sora Ma. The shop front indeed catches my attention with its rustic provision shop feel and the clever play of colours brightens up the shop. The whole setup is an alfresco concept with tables outside the shop front and stretching into the courtyard on a busy day. The shop itself serves as a kitchen. Kind of reminds me of those old school canteens. 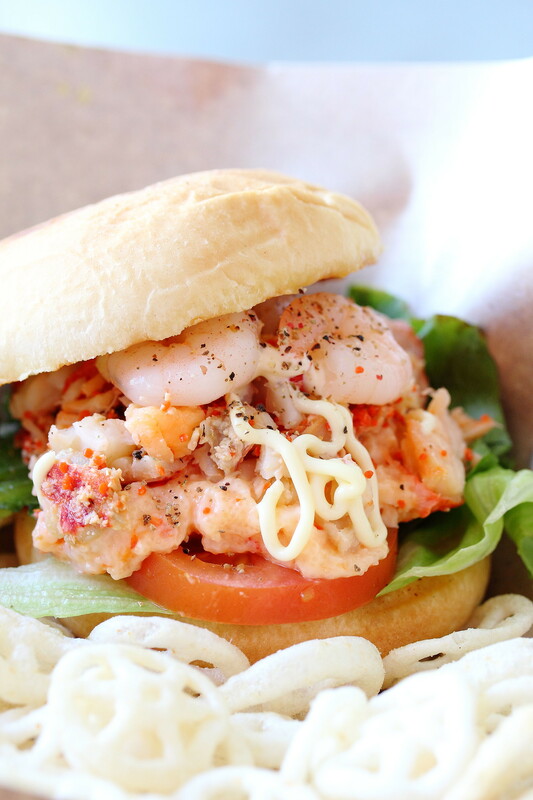 The Happy Peppy Lobster Burger ($16.90) looks quite good in the menu so we decided to get it. 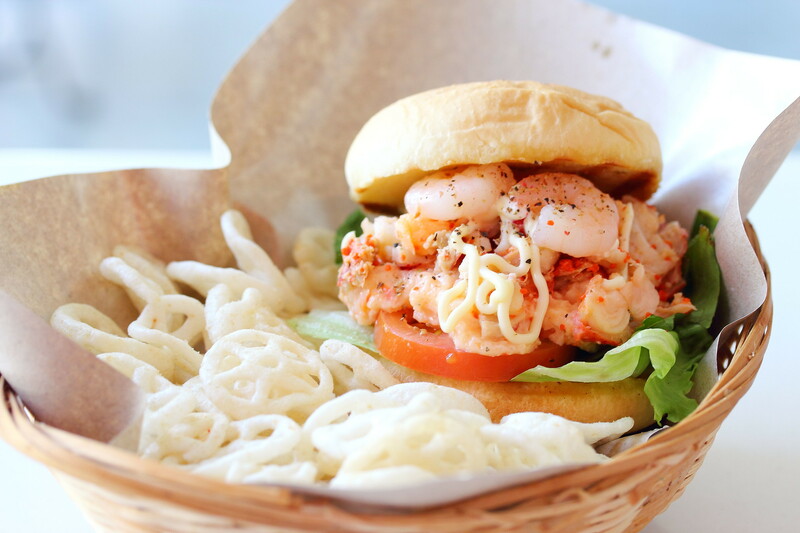 As per the description in the menu, the burger comes with chunks of Canadian lobster and prawns in wasabi mayo sauce. When the burger arrived, I was actually delighted to see the bed of wheel crackers. The childhood snack has been missed and I am glad that The Mama Shop is servicing them. Besides the colour presentation, the burger itself was rather pedestrian. I even asked Charleen whether there was any lobster in it cause I could only find the prawn. I have grown up eating bread with otah and when I saw the Otah Roll ($7.90) on the menu, I instantly checked with the girls whether it is ok for me to get it. 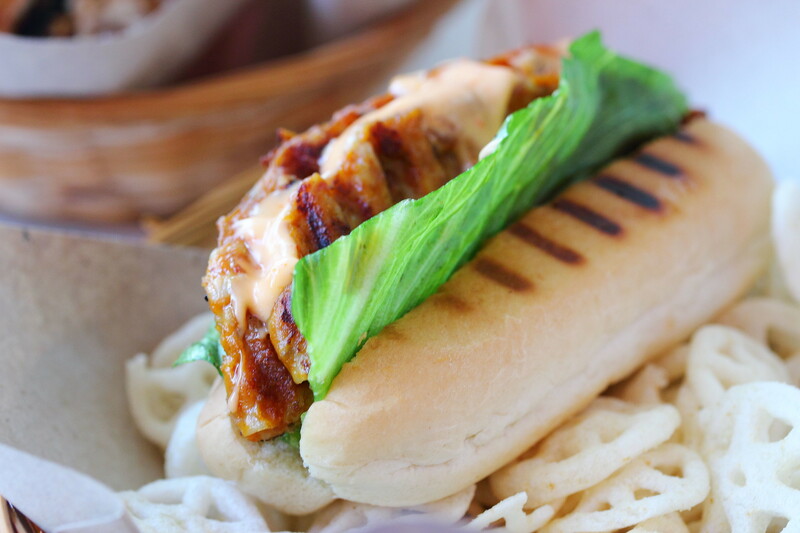 The otah roll comes with grilled Muar otah sandwiched in soft bun accompanied with sweet and spicy sauce. It is comforting, just like having a hot dog bun but nothing to shout about. I would prefer the otah to be spicier though. 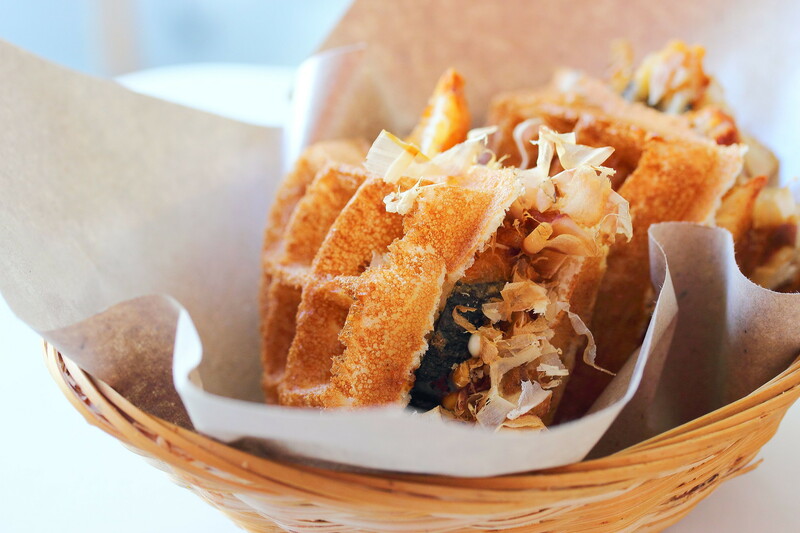 Lastly we tried the Okaasanwaffle ($4.90) which is crispy waffles with savoury seaweed chicken and sweet takoyaki sauce topped with bonito flakes. This is one of the most recommended items on social media and indeed it is the saving grace for our visit. The combination works perfectly with the seaweed and bonito flakes providing the supporting roles to the main casts. For the cost, this is one value for money delicious waffle. 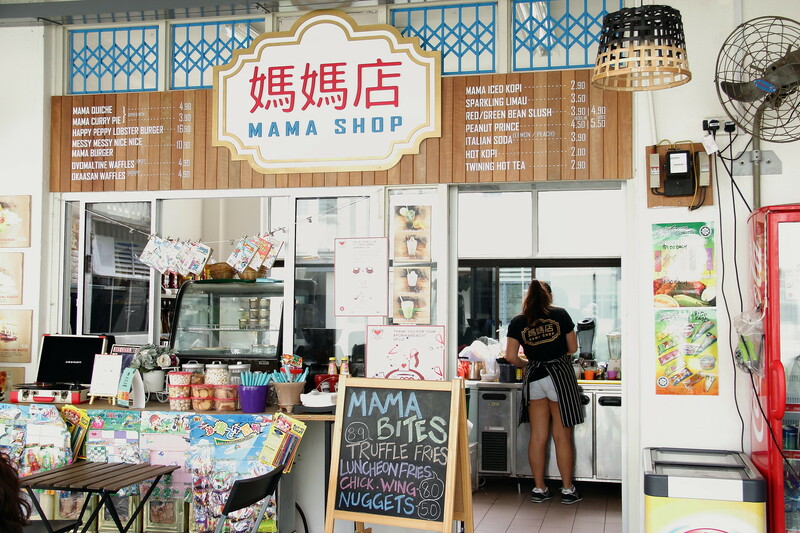 The Mama Shop is a seclude little cafe inside the Old Police Operational Headquarters. It felt like you are in a deserted building, the building is really run down and not probably maintained. However it is also because of this, giving it a form of charm to the tiny establishment. Food wise it is not fantastic but the okaasanwaffle is passable.